Recruiting an apprentice, researching training courses, contracting with training providers, managing your apprentice’s payroll and HR support all takes time and effort, notwithstanding the specialist knowledge needed to navigate the apprenticeship and training landscape. With so many calls on your time, you need a service that’s easy to use and takes the extra workload off your hands. It’s why we at the EDA have teamed up with the experts at EDA Apprenticeships Plus, who have been supporting our members since 2011. The EDA Apprenticeship programme is available across England, Scotland, Northern Ireland and Wales, but please bear in mind that the apprenticeship offer is different in each of the devolved nations. 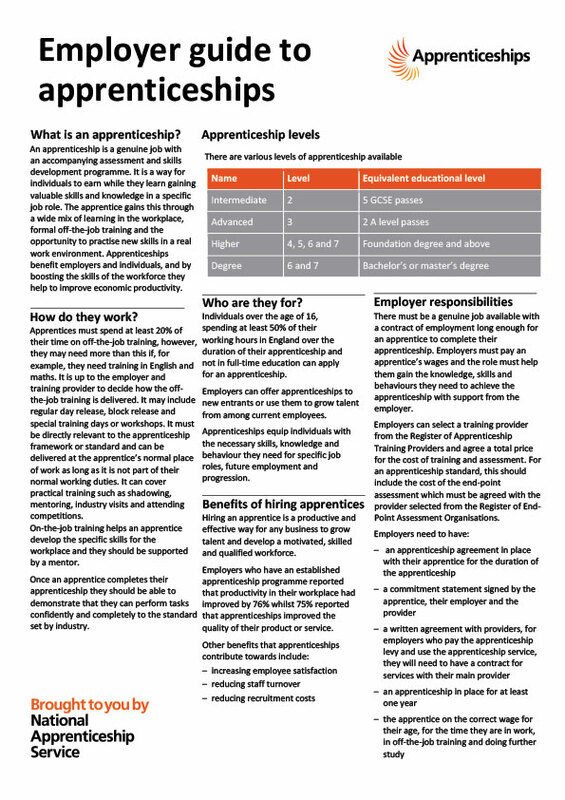 Click on the image below to launch a short factsheet issued by the government’s National Apprenticeship Service. EDA Apprenticeships Plus has worked in partnership with the EDA since 2011. Led by Directors John Henry, Tricia Henry and Duncan Naylor, their team of Account Managers have extensive experience in education and training and their role is to deliver a bespoke service to guide and support you through every aspect of the apprenticeship process, whether you are a manager or an apprentice. Their extensive knowledge of the training landscape in the UK can also help your business take advantage of any prevailing government cash incentives. EDA Apprenticeships Plus offers a menu of services depending upon the size of your business and whether you are a levy payer. Here’s a summary to guide you but we’ll be able to talk you through your options. 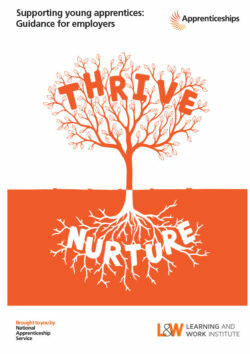 to train the people you already employ. You have fewer than 50 employees, and you do not pay the levy: you can use our ‘hosting service’ which we explain below. In doing so you would pay our 10% management fee and a 5% contribution (reduced from 10% in the 2018 budget) towards the cost of training your apprentice (in England the government pays the other 90%). However, if you had the time and resources to source a training provider yourself, and you would need to find one who could access government funding, then as a small business you could avoid the 5% contribution towards the cost of that training. You have 50 employees or more, and you do not pay the levy: you can use the ‘hosting’ service provided by EDA Apprenticeships Plus which is explained below. You have 50 employees or more, and you pay the levy: EDA Apprenticeships Plus can recruit the apprentice for you and manage the training, but you will employ the apprentice in your business. As a levy payer, remember you can also take advantage of our Levy Management Service. You have fewer than 50 employees, and you do not pay the levy: you can use the EDA Apprenticeships Plus team to manage all the liaison and negotiation with your training provider. You have 50 employees or more, and you do not pay the levy: you can use the EDA Apprenticeships Plus team to manage all the liaison and negotiation with your training provider. You have 50 employees or more, and you pay the levy: you can use the EDA Apprenticeships Plus team to manage all the liaison and negotiation with your training provider. As a levy payer, remember you can also take advantage of our Levy Management Service. The ‘hosting’ service is the most popular service for EDA members and affiliates. Very simply, EDA Apprenticeships Plus employs your apprentice and you ‘host’ them in your business. Apprentices can be any age from 16 upwards, but if you have welcomed a young apprentice age 16 – 24 in your business, the Department for Education has produced a new guide which you may find useful. If you are using the hosting service that’s offered by EDA Apprenticeships Plus not every aspect of the guide will be relevant to you, but it’s well worth a read. Click on the front cover below to open your PDF copy. 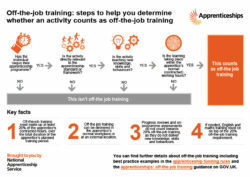 What constitutes off-the-job training? Our flow chart will help you decide – simply click on the image below.